Cruising the Irrawaddy is a fantastic way to see Myanmar and also to get a little bit off the beaten track. 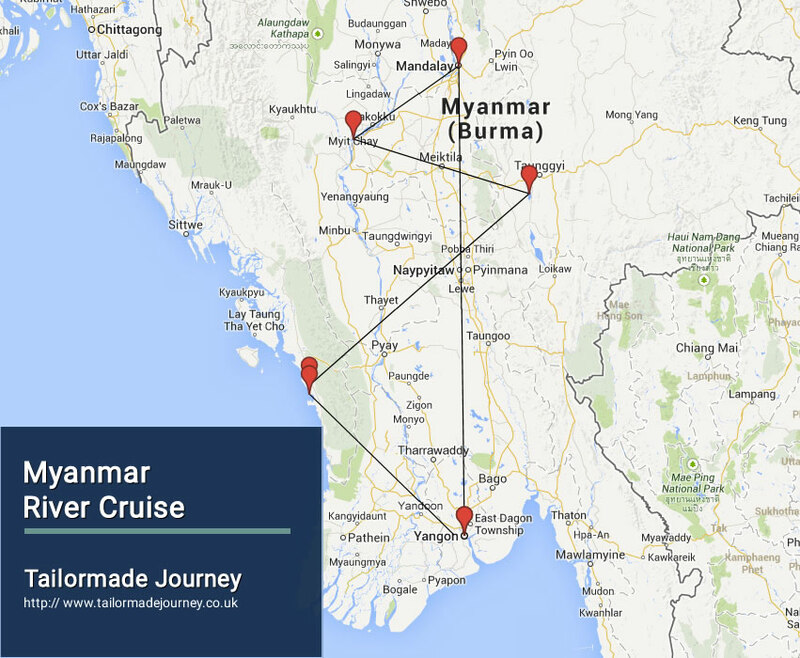 This Myanmar River Cruise itinerary covers the best of Myanmar including Yangon, Bagan, Mandalay, Inle Lake and a few days at the end of the trip to relax on the beach. Yangon lies in the fertile delta of southern Myanmar, on the wide Yangon River. The city is filled with tree-shaded boulevards, with shimmering stupas appearing to float above the treetops. The city became the capital only in 1885, when the British completed the conquest of Upper Myanmar and Mandalay’s brief period as capital of the last Burmese kingdom ended. Yangon remains the de-facto capital of Myanmar despite the development of the new administrative capital in the centre of the country. After breakfast you will be collected for your full day tour of Yangon. Start the day at the Sule Pagoda, a gleaming octagonal pagoda that stands squarely at the centre-point of the city. Afterwards, visit the National Museum to gain an insight into Myanmar’s rich history and diverse cultures. See the eight metre high Sihasana Lion Throne, used by the last Burmese king, and other fascinating artefacts from Burmese history and culture. Enjoy a break at Bogyoke (Scott’s) Market, a pleasant covered market containing crafts from all corners of Myanmar, gems, fabrics and more. (The market is closed on Mondays and public holidays). In the afternoon, visit some of the better-known pagodas, including Botataung Pagoda, named after the 1000 military leaders who escorted relics of the Buddha from India over 2000 years ago. Visit Chaukhtatgyi Pagoda, a reclining Buddha almost as large as the enormous figure in Bago. It’s housed in a large metal-roofed shed on Shwegondaing Lan, just a short distance north-east beyond the Shwedagon Paya. Finally, continue to the highlight of any visit to Yangon, the magnificent Shwedagon Pagoda, one of the greatest religious monuments in Asia. Towering over the city, this pagoda is the most sacred spot in the country, built to house eight hair relics of the Buddha. The Shwedagon Pagoda and surrounding shrines are at their most beautiful during the sunset hour, as the golden stupa reflects the changing colours of twilight. Today you are transferred to Yangon Airport to board Flight for Bagan. Upon arrival in Bagan Airport you will be met for your full day tour of Bagan, visiting the best of the 2,000 listed pagodas and temples in Bagan. Board the RV Paukan before lunch, with lunch on board. Afterwards continue the exploration of the archaeological area before returning to the ship for dinner on board or in a local restaurant. Explore some of Bagan’s local markets selling woodcarvings, fabrics, longyis and rattan products. Visit a workshop to see the ancient technique of lacquer ware making. Alternatively hire a horse cart or a bicycle and explore Bagan independently. The ship departs around midday and cruises upstream all day with a stop at Shwe Pyi Thar village for a walk. Dinner on board is followed by a Puppet Show performance in the village or on the sundeck. In the morning arrive at Yandabo, a picturesque village specializing in Pot-Making, and where the peace treaty of the First Anglo-Burmese war signed in 1826. Go ashore for a walk, stopping at some pot-making workshops and to visit the school and the monastery. Cruise upstream the rest of the day, mooring overnight at Myin Mu jetty. Depart in the early morning by coach (about 1.5 hours) to Monywa to visit the Hpowindaung and Shwebadaung caves where hundreds of Buddha Statues are placed inside niches decorated with wonderful mural paintings. After lunch, visit the splendid Sambuddhai Kat Kyaw Pagoda with its more than 500,000 Buddha images. Drive to Sagaing (about 2 hours) and re-join the ship, which continues the upstream cruise. After an early breakfast visit Mingun the unfinished pagoda, the largest working bell in the world and the “home for the aged”. After lunch explore Ava by horse-cart visiting the beautiful 200 year old teak Bagaya Kyaung Monastery, Nanmyin Watchtower and the Me Nu Ok Kyaung Monastery. Travel by sampan and coach to Amarapura, the penultimate Burmese Royal Capital (1783) to visit U-Bein Bridge at sunset. The ship moors overnight at Sagaing. Enjoy a Dance and Theatre performance on the Sundeck. After breakfast, visit central Mandalay. Visit Mahamuni Pagoda and Mandalay Hill where spiralling staircases lead to sweeping views of the city and its temples and the nearby Kuthodaw Paya, which contains the world’s biggest book. Mandalay has many local industries and the visit encompasses gold leaf, tapestry, wood carving, marble and bronze workshops. Enjoy lunch on board or in a local restaurant. After lunch it’s time to disembark and transfer to the airport for your onward flight to Heho. On arrival in Heho (Inle Lake) you will be transferred to your hotel for check-in with the rest of the day at leisure. After breakfast you will be collected from your hotel for your full day tour of the beautiful region of Inle Lake. Inle Lake, located in Shan State, is a scenic highlight of Myanmar, with very calm waters dotted with patches of floating vegetation and fishing canoes. High hills encircle the lake on all sides. The lake’s shore and islands bear 17 villages on stilts, mostly inhabited by the Intha people. Enjoy the spectacular scenery and observe the skilled fisherman using their leg-rowing technique to propel themselves around the lake. Visit the floating gardens, a market and an Intha village around the lake (please note that no markets take place on full moon or new moon days). The day sightseeing also includes a visit to the Phaung Daw Oo Pagoda, Inn Paw Khon Village (Lotus and silk weaving) and the Nga Phe Kyaung Monastery. Overnight Stay at the Hotel in Nagapali. Overnight Stay at the Hotel in Nagapali Beach. Today you are transferred to Thandwe Airport to board flight for Yangon. Upon arrival in Yangon Airport connect flight for onward Journey. The RV Paukan is a charming boutique River Cruiser established in 2007 accommodating a maximum of only 55 passengers.RV Paukan was built in 2007 at the Myanmar Shipyards in Yangon for Ayravata Cruises. The Yangon River and its dockyards were commented upon over two hundred years ago as "the most favourable river in the world for naval architecture" by the first British envoy to Myanmar Captain Michael Symes of His Britannic Majesty's 7th Regiment who arrived in Yangon in February of 1795. For luxury-living, Paukan has suites, deluxe or superior cabins as well as singles for guest or guides. There are two massage rooms on the lower deck offering traditional Myanmar massage designed to give soothing relaxation.The sun deck has a stage for cultural performances, and a bar and lounge for relaxation and fun. The upper deck has a lecture / movie room with LCD projector and LCD TV screen. Meals in the dining room on the main deck will include both East and West cuisine, and dinner menus of delicious dishes. Vegetarian meals can be prepared when informed in advance.